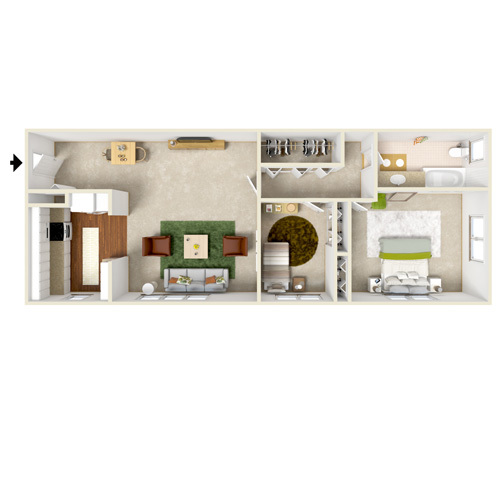 Please scroll down to see Dohr and North Dohr floor plans. 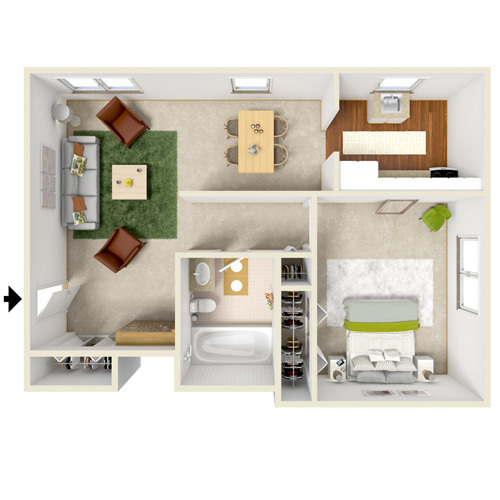 This floor plan is 510 square feet. It has an open kitchen, a spacious great room, and a bedroom with large closet. 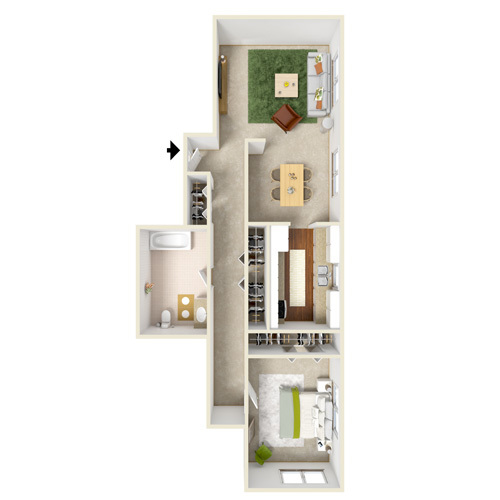 This floor plan also has a coat closet and linen closet. Rent is $655. This two-bedroom, one-bath apartment features a U-shaped kitchen with island and pantry. The kitchen overlooks the living and dining area. A hallway leads to the bathroom, the master bedroom, and the guest bedroom. This floor plan features oversized picture windows in the living room for ample natural light. 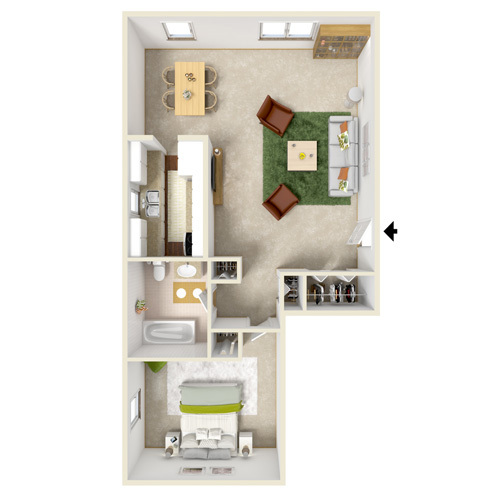 Enter this two-bedroom, one-bath apartment and you’ll find a dining nook, an open living area, and a large kitchen with ample cabinets. A door leads into a private dressing area, which has access to the master suite and the guest bedroom. The bathroom is located off the dressing area. NEWLY REMODELED! 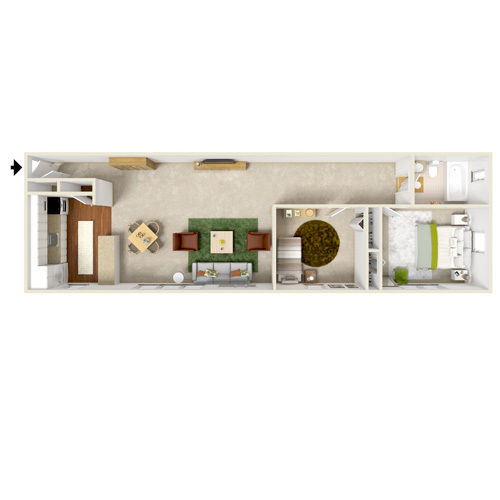 This one-bedroom, one-bath floor plan features spacious closets, large picture windows, and a convenient layout. The living room leads into a separate dining area, with the galley-style kitchen featuring a window over the sink and wood flooring. Rent ranges from $695 to $725. NEWLY REMODELED! The foyer with coat closet leads into the open living and dining area of this one-bedroom, one-bath apartment. The galley-style kitchen opens to the dining room. The bedroom is located away from the living area for privacy and features a large window. Rent ranges from $695 to $725. NEWLY REMODELED! This one-bedroom, one-bath apartment has a private foyer with a large coat closet. The hallway leads to the bathroom and bedroom and features another spacious closet. The living area leads into the separate dining room. The galley-style kitchen has a window over the sink and wood flooring. Rent ranges from $715 to $725. NEWLY REMODELED! 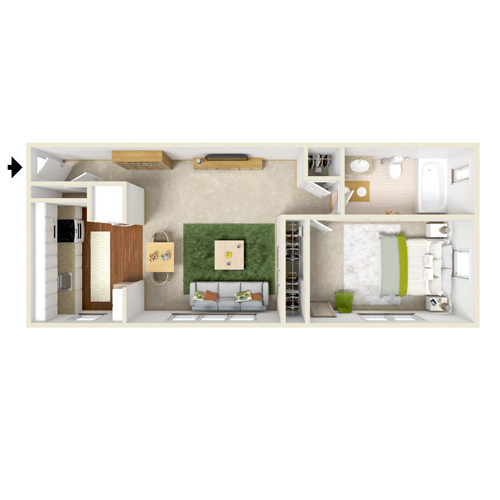 The two-bedroom, one-bath floor plan at North Dohr features an open great room, a galley-style kitchen, and two large bedrooms. The ample closets in this floor plan include a coat closet in the foyer and a linen closet near the bathroom. 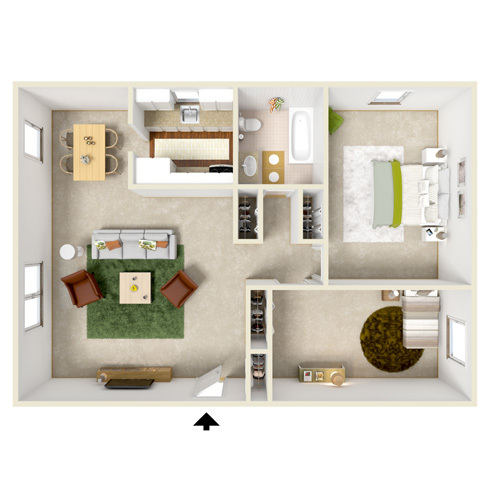 This apartment features 900 square feet of living space and ranges from $815 to $845.